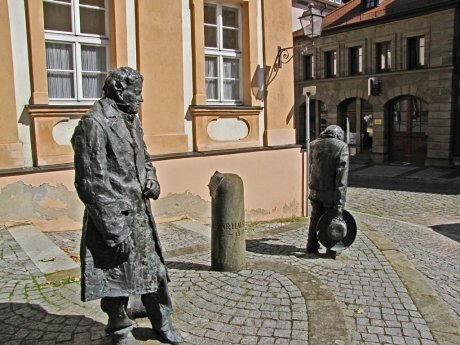 Monument to the foundling Kaspar Hauser in Ansbach, Germany. Flickr/George Lezenby. Some rights reserved. The Middle High German poems of Ortnit and the Heldenbuch epics feature a character whose miraculous story echoes throughout the pages of German literature and on into today’s Zeitung: Wolfdietrich—a boy abandoned by his father, the Emperor of Constantinople, is left in the forest to succumb to the elements, if not first to the wolves. Rather than devour him though, the wolves protect and rear him - in their mercy creating a man who, on his return to civilization, would outshine his peers and claim his inheritance as ruler of the kingdom of Constantinople. The real-life occurrence of feral boys in Germany taps straight into this myth, such children being called Wolfskinder. Here too, Germany has had numerous encounters – both the legitimate and hoax variety. Claude Levi-Strauss asserted that myths derive their source material from the past, but that their operational value lies in the insight they offer not only into that past, but also into the present and the future. With that in mind, a consideration of various instances of Wolfskinder in Germany begins to reveal a myth repeatedly enacted in German film, theater, and also in the Zeitungen ( explain what this is at first mention above), as German encounters with feral children have persisted into the 21st Century. Might the myth of the feral boy’s encounter with society yield some greater insight into the German mind? The concept of feral children owes much to the advent of Natural Philosophy (the study of nature that was the precursor of ‘science’) in seventeenth century Europe. Occurrences in the natural world - that although previously encountered had never thoroughly been investigated - began to be documented. Feral children was one such phenomenon (Newton, 2002: 18). It is worth noting, too, that the word feral in this context has acquired a somewhat chameleon nuance. Here it will be used to describe a child who has lived outside of society, experiencing key stages of development independent of civilization and socialization. Often exhibiting asocial behavior and a single-minded pursuit of their selfish needs, the feral child is one in whom we may recognize few of the qualities we regard as elevating us above other animals - a troubling insight. Although the first case considered here ultimately involves England more than it does Germany, it is nevertheless useful both for its German origin, and for the contrast in societal response that it offers compared to the other case studies. In 1725, a young boy was found by Hamelin townsfolk at the edge of its woods, as if the same oblivion that had swallowed the town’s children when they followed the Pied Piper in 1284, had offered one back. The child, who would come to be known as Peter ‘the Wild Boy’, allegedly walked on all fours and had been subsisting on plants and greens in the forest (Newton, 2002: 27). Peter came to the attention of King George I of England, who was visiting his nearby homeland of Hanover and, captivated, the king brought him back to England in the spring of 1726, where he was treated as something between an amusement and a charity case. Interest in Peter eventually waned, especially with his failure to progress under the tutelage assigned to teach him to speak and write. Passed from one caretaker to the next, he died in 1785. Peter’s weak response to the treatment and education offered him at the king’s court lost him the interest of the British public for whom the nobility of the noble savage could seemingly only be attained through a discernable move towards civilization, and the attainment of that self-awareness that it identified with humanity. In the German states, the crisis was less about what it is to be a man, than what it is to be a German. Marsha Morton has characterised the growing pursuit of a cultural identity as the one solid rallying point in a time of great political upheaval, as well as a way to resist occupation not only by Frenchmen, but by French Enlightenment values as well. This pursuit led the middle classes of the German states towards a mystical, rather than a scientific approach to Nature. Wearing the mantle of a quest for knowledge, Romanticism pushed symbolism and allegory in the arts, and in religion it promoted ‘untamed’ nature as a precious link to the divine. A few years after Peter’s death, Ludwig Tieck famously characterized the forest as a ‘holy temple’. What must he have thought of this boy who was raised by the forest? Romanticism spoke to the German middle class’ desire to distance itself from civilization, or Zivilisation - which as Wolf Lepenies described in his 2006 book The Seduction of Culture in German History, the Germans came to regard as a particularly French construct (2006: 4). Viewed as a French expression of identity, and comprised of politics and questions of the state (things over which the German middle class had no control), Zivilisation spoke to them of their middle class subjugation and humiliation. Norbert Elias wrote of the great frustration felt when the aristocracy’s political power continued largely unchallenged into the unification of the Deutsches Reich in 1870 (Elias, 1989: 54). In response to this frustration, and to facilitate the differentiation of their identity from those of their oppressors, Zivilisation became the enemy. By contrast culture, or Kultur, was the domain in which the true spirit of the German middle class found its expression (Elias, 1989: 126-127). The identification of Kultur as the voice of the German middle class resulted in the proliferation of an oeuvre that strove to both document and define manifestations of Kultur. Friedrich Karl von Savigny (and others’) Monumenta Germaniae Historica, created a vita populi of German folk culture, and remains an exemplar of this oeuvre. Jacob Grimm - whose help Savigny enlisted for his own project - collected fairytales with his brother to create one of the most famous such documents of this effort, Kinder und Hausmärchen. Lepenies (2006: 5) states that in Kultur the middle class found a “noble substitute for politics, if not a better politics altogether”. As Kultur became the realm in which the German middle class truly found their voice, Romanticism took hold as its purest incarnation. On Whit Monday of 1828, a young man appeared in Nuremburg, his awkward gait and oversized clothing attracting the attention and concern of a local shoemaker. While the townspeople tried to determine his origins, the boy was housed in a series of residences. With him were two notes, one stating he had lived since 1812 with the note’s writer, never having been allowed to leave the house. The other, supposedly written by one of his parents, gave the young man’s date of birth. Later given a pen and paper, he wrote out the name Kaspar Hauser—and so a legend began (Newton, 2002: 129-131). Questioning drew out details of the boy’s life before his arrival. Confined to a small cell with little light, his only companion had been a toy horse. He was daily brought bread and water by a figure who never spoke to him, nor allowed his own face to be seen. Then one day the figure revealed himself, and began teaching Hauser how to write his name. Forays outside the cell began, where Hauser described being overcome by the light and smells as he was taught to walk properly, and given new clothing to wear. Eventually he was led one final time from the cell and guided to the edge of Nuremburg where he was left, carrying the letters that would be the only clue to his past (Newton, 2002: 135-136). Hauser became the cause of a young Professor, Friedrich Daumer who had a keen interest in Romantic ideas of the interconnectedness of man and nature, and of Paul von Feuerbach, a respected and Romantically-minded lawyer with a side-interest in the unknown depths of the human mind (Newton, 2002: 138). Under their tutelage and experiments Hauser acquired more language and improved social skills, though his extreme sensitivity to the material world remained. With his shadowy origins devoid of civilization and his at times crippling sensitivity, Hauser was viewed as a Romantic figure, eliciting both envy and pity (Newton, 2002: 149). The mysterious story took an even more fantastical turn when an attempt was made on Hauser’s life. Although he survived, the incident played into the hands of people intent on seeing a grander narrative in his story. Now Hauser became more remote: his curiosity was replaced with suspicion, and Professor Daumer believed he had begun to lie. Feuerbach characterised the attack as stealing Hauser’s childhood from him for a second time - a crime he dubbed “soul murder” (Newton, 2002: 153). Contrasting Feuerbach’s stark concept of “soul murder” with Defoe’s verbose pamphlets debating (and deciding against) the existence of Peter the Wild Boy’s soul indicates how differently such a man was considered from a Romantic as oppose to an Enlightenment perspective. One of the most debated aspects of Hauser’s story, though, is the interest England’s Lord Stanhope took in his life. A frequent visitor to the German Confederation on business, Stanhope’s interest in Hauser was piqued on hearing the story, although it was 1831 before the two were allowed to meet. Unlike the relationship between King George I and Peter the Wild Boy, here grew a relationship based not only on patronage but also on friendship: the biographer Elizabeth Evans even described the level of closeness exhibited between Hauser and Stanhope as immoral. This bond with Lord Stanhope and his change in temperament following the attempt on his life all contributed to a chilling of relations between Hauser and his other friends and guardians - some of whom began to doubt his story (Newton, 2002). In December of 1833, Lord Stanhope was away on business when Hauser was attacked by yet another shadowy figure, whom Hauser said had lured him to the abandoned gardens of the palace in Ansbach, promising to tell him the truth of his origins. Three days after being stabbed, he died, and the perpetrator was never identified (Newton, 2002: 161-163). Three years later Lord Stanhope renounced his once dear friend, and published a book wherein he claimed Hauser was an imposter—a peasant who had become so woven into his own fabric of deceit that the role of Kaspar Hauser became natural for him. Stanhope even claimed that Hauser had stabbed himself in a bid to gain sympathy from an increasingly distant and hostile network of friends. These claims of Hauser’s imposture were not only shocking in their disavowal of a friendship, but they represented a rebuttal to a growing theory that Kaspar Hauser had been the rightful heir to the title of the House of Baden, swapped as an infant with a dying baby so that a competing bloodline could take the throne. Like Wolfdietrich, Hauser was a disinherited exile from society, yet unlike Wolfdietrich, there was no glorious return to the throne - the only redemption in Hauser’s story was its own Romantic tragedy. While labored efforts to fit Hauser’s story around a larger narrative framework of aristocratic conspiracies and Romantic plots of changeling princes may make some sense in the context of the time - an alienated middle class creating a heroic figure that both affirms their dim view of the ruling class while becoming the personification of their spiritual mores - one might question why this theory has retained a certain cachet even into the present day, despite the fact that it has been officially discredited by a comparison of Hauser’s DNA with that of a descendant of the House of Baden (Sperber, 2003: 1070). Kultur and Zivilisation, Sehr links his theory of Hauser’s sustained relevance to an attack on German political figures of the time like Helmut Kohl, whom he considered unable to deal with Germany’s tragic history, especially the Nazi war crimes. Hinrich Seeba (1989: 145-146) took a more sympathetic approach to the gravitation towards Romantic figures after Nazism - this time among German exiles trying to redeem German studies in America. Through a focus on German humanistic writers, and an attempt to extricate the positive aspects of their own cultural frame of reference from the evils of Nazi politics, Seeba portrays this effort as a noble attempt to keep alive a dialogue about Germany, rather than see it marginalized into oblivion. Ultimately Romanticism remains tainted by the appropriation of so many of its themes into Nazi ideology. Jurgen Habermas asserted that the disaster of the Holocaust could only be confronted and countered with an unqualified rejection of the “naïve nationalism” that preceded it - a nationalism that had fused around many Romantic ideals, such as a reverence for the land and a respect for mediaeval mysticism as a source of true German spirituality. Consequently post-war Germany has sought redemption by pursuing many Enlightenment values, rationalism especially. Nevertheless, in the internal exile in which Romanticism has languished in post-war Germany, encounters with feral boys (even those established as shams) have - while they have lasted - once more lit a fire under Romanticism. In August of 2011, a young boy brought a fantastic story of emotional and spiritual exile to a bastion of Zivilisation in Germany, Berlin’s Rotes Rathaus (city hall). Saying he had walked there directly from the forest where five days before he had buried his dead father, he spoke only English, and gave his name as ‘Ray’. The boy said his mother had died years before in a car accident, after which his father and he had retreated to the woods, their home for the last five years (Dowling, 2011). Ray’s story was covered internationally, and - while trying to trace his pre-forest identity - the German authorities were careful to protect the vulnerable boy. He was placed in a youth care home, and little information was released to the public. Language experts who had spoken to Ray were said to believe that English was not his first language, though they could not identify his mother tongue. Despite his clean appearance on arriving at the Rathaus and his facility with mobile phones and a laptop in the care home, Ray’s story was taken seriously. Dubbed the ‘forest boy’, numerous articles were written comparing him to Kaspar Hauser, and imagining his wild life with his father - two heartbroken males soothing their grief with the balm of a natural existence. American west, ‘Indianthusiasts’, or German ‘Hobby Indians’ allowed May’s fans to congregate and enact fantasy representations of North American First Nations’ culture by living in teepees, having pow-wows, and wearing buckskin. With 80,000 registered members in 2006, the harmony between First Nations man and nature first trumpeted by May clearly continues to compel many Germans (Harris, 2006). In the context of such societies, it becomes easier to understand how a story like Ray’s may be seen less like a puzzle to be subjected to rigorous inquiry than it is a prototype for ideas otherwise relegated to fantasy. After nine months police finally sought Ray’s permission to publish his photo. In exposing his face to the world, police exposed his fraud too. Contacted by two different people from the Netherlands, Ray was revealed to be Robin van Helsum, a runaway reported missing three days before Ray walked into the Rathaus, who had last been seen traveling to Berlin (Wiener, 2012). While stories such as this may seem patently bogus in hindsight, there seems to be a significant insight to be found in German society’s reaction to these feral boys regardless of the truth of the story itself. Initially revered as an embodiment of Kultur, the feral boy quickly becomes a case to be dealt with, with Zivilisation presiding over the proceedings. So begins a grand rescue mission that is as therapeutic for the rescuer as it is often traumatic for the rescued: the boy is given an official identity; the state takes responsibility; he is educated. In effect the wild boy is made a citizen, and thus honored by being brought into the fold. In becoming a person in the eyes of the state the feral boy is redeemed. Yet he is faced with an impossible challenge: if he responds to these gifts of Zivilisation, he loses what has made him special. Contrarily, failure to respond results in frustration on the part of society: the prophet has rejected the gifts offered him and society finds itself at a loss for what to do with him. In this desire to see the feral boy as both the embodiment of Germany’s spiritual essence, and a charity case to be rehabilitated through (and thus validate) the benevolence of the state, the feral boy cannot survive intact. In contrast to the Enlightenment societies of France and England, in Germany the feral boy must gain his place in society at the cost of his soul. Personifying a Romantic ideal, the feral boy’s existence apart is initially admired. Paradoxically though, an attempt is then made to do the right thing, and integrate him into society. In socializing the ahistorical figure, all that made him special and worthy of veneration is removed, while simultaneously he is given a task in which he must ultimately fail—to become a normal young man. In this way the myth of the feral boy becomes a mirror of the German people’s own tormented attempt to create a national identity from conflicting ideologies. Even now as generations of hard work and resolve have made German Zivilisation the lynchpin of the European Union, the country knows that it must tread lightly in its ministrations lest it give the world the impression of enjoying the power too much. Even within Germany this is feared by many, who would rather see Germany known for its beneficent Kultur (e.g. Wagner; the documenta art fair; Oktoberfest) than its troublingly efficient Zivilisation (e.g. Nazism, the Stasi, and of course that strange reputation Germans have among Britons of getting up early at vacation resorts to claim all the best sun loungers). As Germans have long known, too much Zivilisation is poison to the Kultur. Perhaps the only real redemption available to the feral boy lies in the way that his mythic tale – in which redemption through Zivilisation leads to the sacrifice of his soul – has come to stand as the ultimate cautionary tale for Germany. Dowling, S. (2011) ‘German police baffled by case of English-speaking boy with no identity’, The Guardian, 16 September [Online]. Available at: http://www.guardian.co.uk/world/2011/sep/16/german-police-english-speaking-boy (Accessed: 28 November 2012). Elias, N. (1989) The Germans. Translated by Eric Dunning and Stephen Mennell. Reprint, Cambridge: Polity Press, 1996. Harris, G. (2003) ‘German ‘Indianthusiasts’ fuel Aboriginal tourism’, University of Calgary In The News, [Online]. Available at: http://www.ucalgary.ca/mp2003/news/july06/Indianthusiasts.html (Accessed: 19 October 2012). Lepenies, W. (2006) The Seduction of Culture in German History. Woodstock: Princeton University Press. Morton, M. (2002) ‘German Romanticism: The Search for ‘A Quiet Place’’, Art Institute of Chicago Museum Studies, 28(1), pp. 8-23, 106-107, JSTOR [Online]. Available at: http://www.jstor.org/stable/4113048 (Accessed: 14 October 2012). Newton, M. (2002) Savage Girls and Wild Boys A History of Feral Children. London: Faber and Faber Ltd.
Seeba, H. C. ‘Critique of Identity Formation: Toward an Intercultural Mode of German Studies’, The German Quarterly, 62(2), pp. 144-154, JSTOR [Online]. Available at: http://www.jstor.org/stable/407365 (Accessed: 14 October 2012). Sperber, J. (2003) ‘Kaspar Hauser’. Review of Kaspar Hauser: Europe’s Child, by Martin Kitchen. Journal of Social History, 36(4), pp. 1069-1071. Van der Wal, M. J. (1999) ‘Feral Children and the Origin of Language Debate: the Case of the Puella Trans-Isalana or the Kranenburg Girl (1717)’ in Hassler, G. and Schmitter, P. (eds.) in Sprachdiskussion und Beschreibung von Sprachen in 17. Und 18. Jahrhundert. Münster: Nodus, pp. 151-161, [Online]. Available at: https://openaccess.leidenuniv.nl/bitstream/handle/1887/16314/1999a_vdWal-Feral%20children.pdf?sequence=2 (Accessed: 20 October 2012). Wiener, A. (2012) ‘Germany’s mysterious ‘feral child’ is neither’, Los Angeles Times, 15 June [Online]. Available at: http://latimesblogs.latimes.com/world_now/2012/06/germanys-mysterious-forest-boy-is-neither.html (Accessed: 7 October 2012). Elizabeth E. Evans was a harsh critic of Lord Stanhope in the 1890’s, and an early promoter of the conspiracy theories that saw him as an agent of the House of Baden, charged with destroying Hauser. She suggested that a homosexual relationship had been forced on an innocent Kaspar Hauser by the manipulative Lord Stanhope to cement Hauser’s loyalty, claims later strongly refuted by Lord Stanhope’s daughter (Newton, 2002).